Early May of 1912, Harris Funeral Home was organized. Since that time, it has been the privilege of owners past and present to serve the people of Abbeville, SC and the surrounding communities. We have progressed from the day of the horse-drawn vehicle to the present day of paved roads and automobiles. In April of 1912, Mr. William A. Harris, then a young man who had just completed his course at the Echols School of Embalming in Cincinnati, OH, returned to Abbeville to assume the junior partnership in the newly formed Harris and Calvert Funeral Directors and Practical Embalmers. The business occupied a small space in the rear of the Calvert Furniture Store. As the years passed, the business expanded. In 1918, a new building was erected to house the undertaking plant. Most locals remember this building as Nickles Dry Cleaners. In 1921, Mr. Harris purchased the interest of Mr. W.A. Calvert and operated the business personally. In 1927, realizing the need to enlarge, Mr. Harris rented the building on the square near the Eureka Hotel (Belmont Hotel). Here, he made changes as needed in that day and time. A small chapel, ample display room, a business office and a reception room seemed to answer those needs. With the progress of Abbeville and the changing demands of funeral service, this place soon became inadequate. One of the greatest objections to the crowded area was the lack of available parking space. In 1939, within two blocks of the square, in a stones throw of many churches of the community, ample grounds for an ideal establishment was located. Mr. Harris once again made the decision to move the funeral home to its present day location. Assisting Mr. Harris was Mr. G.H. McIlwain who was married to Mrs. Mabel Smith McIlwain. Mr. and Mrs. McIlwain lived in the funeral home and assisted Mr. Harris with all the duties of the funeral home. Other assistants in 1939 were Guy Copeland and William B. Chandler. During the early 50’s, Mr. Harris decided it was time to retire. He sold the business to Mr. William B. Chandler. From 1951 to 1989, Mr. Chandler and his brother, Harry W. Chandler, owned and operated Harris Funeral Home with uncompromised service and a complete passion for taking care of the families they served. In 1989, William B. “Bill” Chandler decided he was ready to retire and once he and his brother decided neither one wanted to take on ownership alone they sold the funeral home to Mr. Wayne L. Gantt who owns Blyth Funeral Home in Greenwood, SC. During the years of 1990 and 1991, Mr. Gantt completely remodeled the funeral home adding a chapel, extra rooms and a casket display room. Even though he was not from Abbeville, Mr. Gantt wanted to make sure his remodeling endeavor would be an asset to the community and something the people of Abbeville would be proud of. In September of 2003, Mr. Gantt sold the funeral home to the present owner, a native Abbevillian, C. Brad Evans. Brad was born and raised in Abbeville. He is the son of Mr. James B. Evans, Jr. and the late Cornelia Ashley Evans. Brad graduated from Abbeville High School and Gupton-Jones College of Mortuary Science in Atlanta, Georgia. He has a wealth of experience in the funeral business. He served his 2 year apprenticeship at Dunbar Funeral Home in Columbia. He then moved to Atlanta for school and was employed with A.S. Turner and Son Funeral Home. After mortuary school, with the goal of someday owning his own funeral home, he moved to Pageland, SC and worked for Sutton Funeral Home, a much smaller funeral home than those he had always worked. Realizing he missed the atmosphere of a much larger funeral home, he was offered the opportunity to move to Charleston, SC to manage McAlister-Smith Funeral Homes. Thinking he would never leave Charleston, in the summer of 2003, Brad was contacted by Wayne Gantt and offered the opportunity that he always wanted, to own his own funeral home. He was excited to have the chance to move back to his hometown, where his family lived, and serve the families him and his family had known all of their lives. In September of 2005, Brad married Abigail Walden and they made their home in Abbeville, SC. In March of 2007, they had a son Gage Andrew Evans. 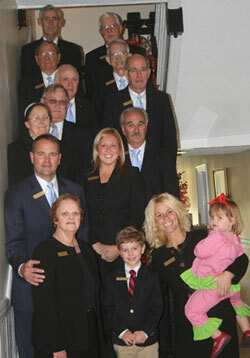 As the youngest funeral home owner in South Carolina that was not raised in the business nor handed down to him, he gives much of his success to God, his family - wife, Abby; aunt, Nancy Ashley Dunn; sister, Jennifer E. Hughes; father, James B. Evans; brothers, Jimmy & Mike Evans; late grandmother, who inspired him to help others, Marie Miller Ashley and late mother, Cornelia A. Evans, who stood beside him every step of the way. In 1999 when Brad's mother died suddenly, it gave him a different outlook on funeral service. He was able to see the funeral business from the side of those he served. He was also able to prepare her for burial; as well as, assist with her funeral and will always cherish that opportunity.